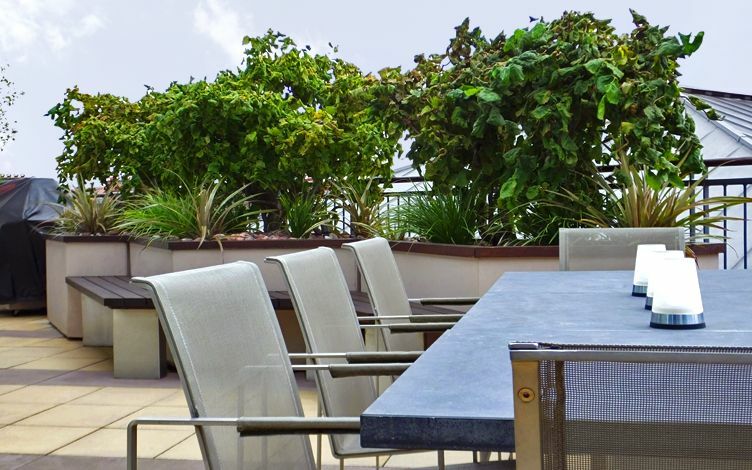 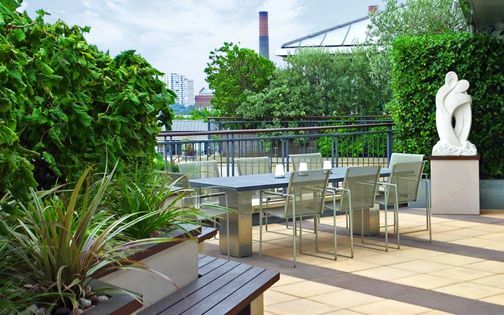 The terrace atop Kings Chelsea features abundant, interconnected detail, where a streamlined layout merges rooftop tranquillity with interior sumptuousness to enhance ergonomic design comfort and architectural fluidity. 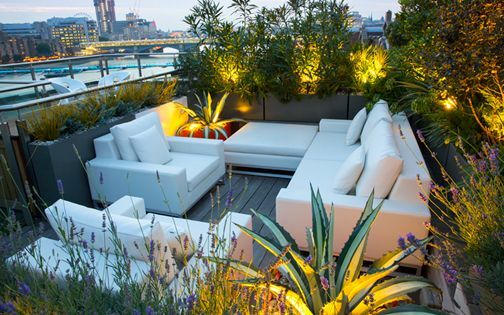 Our clients sought a clean, modern outdoor space, seamlessly integrated into their contemporary penthouse apartment, to entertain guests intimately amid a London skyline. 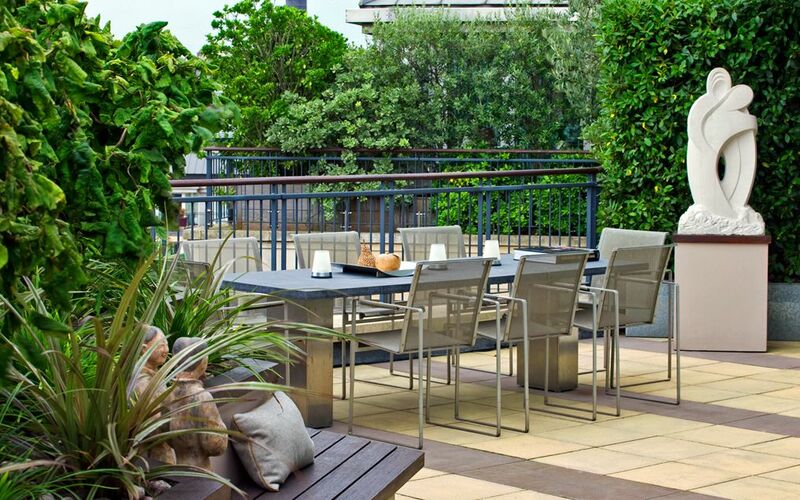 The living room terrace backs onto the development's landscaped gardens, and although shaded, its skyline presents an expanse of familiar London landmarks. 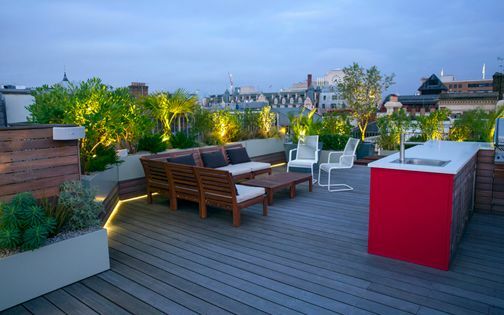 With the exception of retaining most of its concrete paving, the entire rooftop terrace was redesigned. 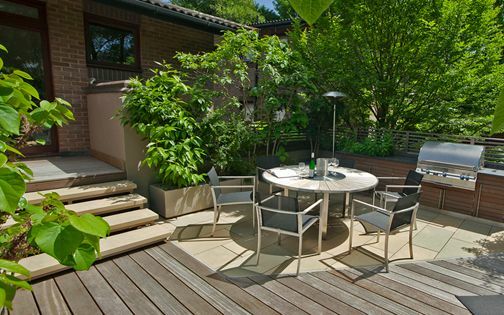 The floor was reorientated at forty degrees, increasing precious usable space, where bands of lilac sandstone replaced pale pavers every fourth line, adding rhythm and colour. 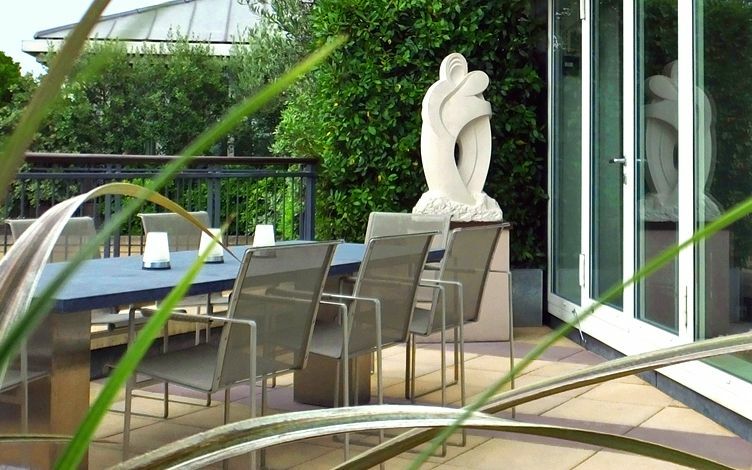 A contemporary sculpture was specially crafted for the project in Portland stone; the Hug artwork, designed by the sculptor Elliott Brotherton, infuses intimacy and enhances light quality, while forming an essential focal point. 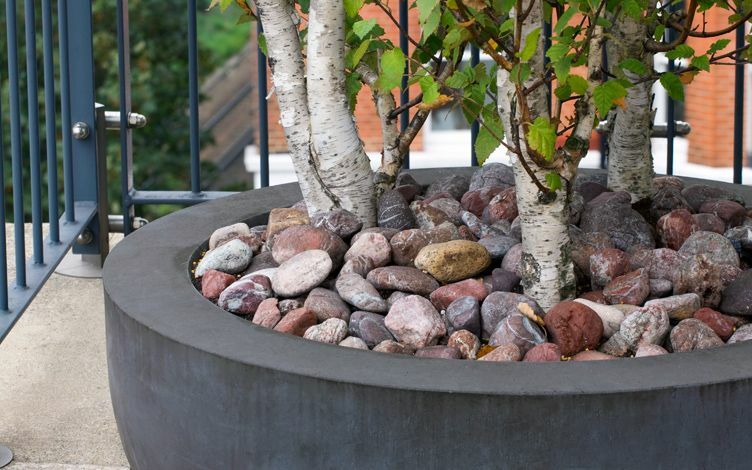 White Silver birch trunks emerge from a slate-grey Urbis bowl at the terrace's far end, mulched with a natural mound of carmine cobbles which reiterate the paving's lilac hues. 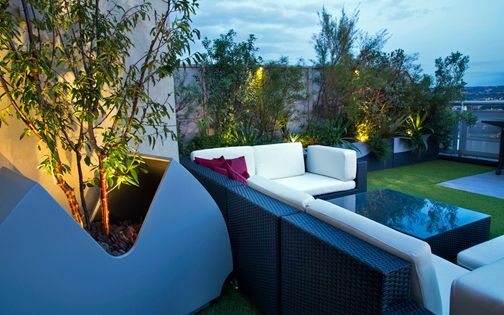 The space beyond the tree is annexed to a guests' bedroom, providing a small L-shaped area with informal seating. 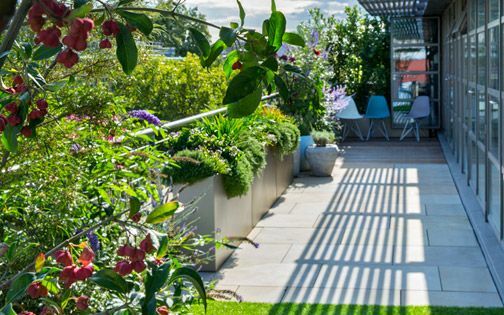 Sizeable raised beds enhance sense of depth and vital scale within the roof terrace, while their angularity and pattern echo the apices of local pitched rooftops in the backdrop. 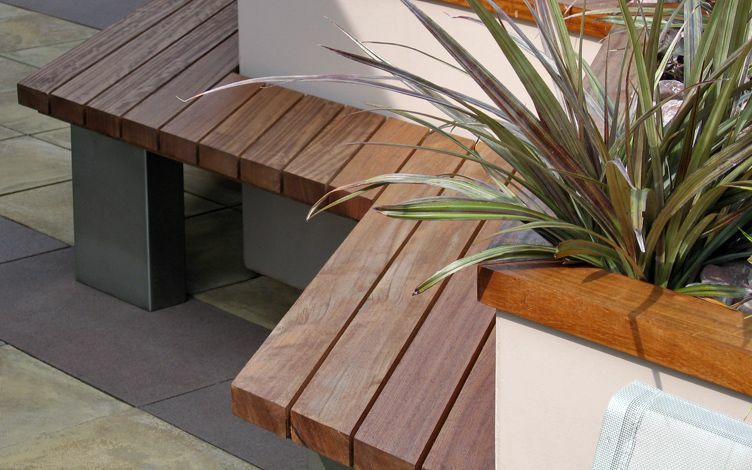 A bespoke bench design fits perfectly into this elevation, detailed in solid Iroko and stainless steel columns, alongside architectural terrace planting featuring Corkscrew hazels, Mountain Astelia and Carex sedges. 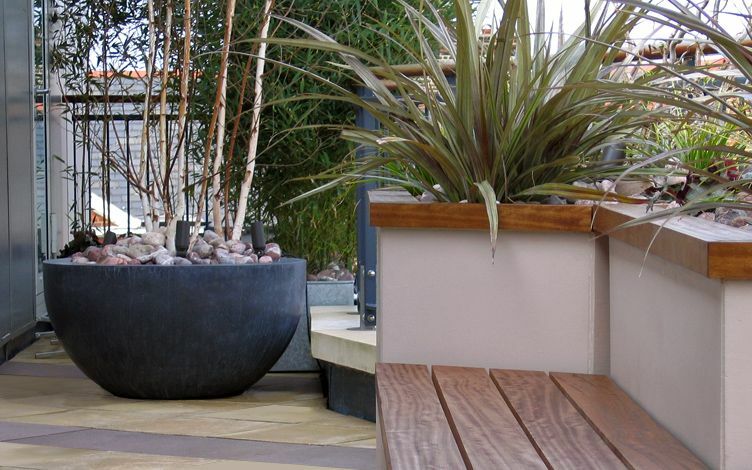 The existing concrete paving was reused and tilted at an angle, where its renewed layout balances an elongated roof terrace, adding pivotal dynamic movement, similar to a blueprint we developed in Grosvenor Waterside nearby. 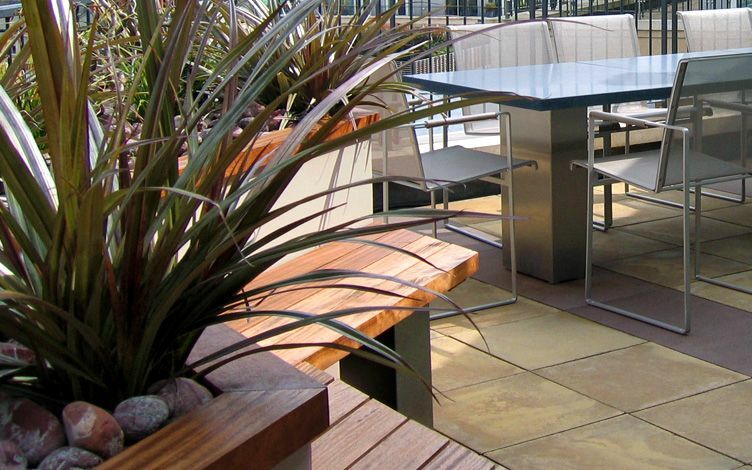 Lilac sandstone was integrated in bands, at equal intervals, to produce bays which define various seating zones. 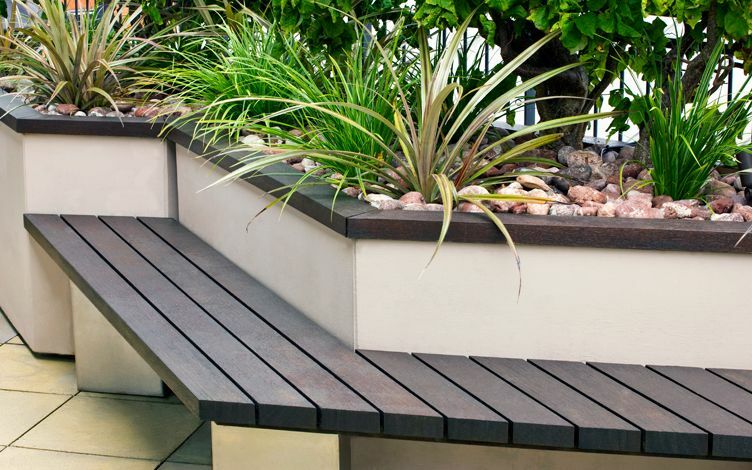 Three raised beds align across the angular paving grid, featuring contorted Hazels and bronze-leaved grasses, where smooth Iroko coping mimics the bluestone dining table's profile. 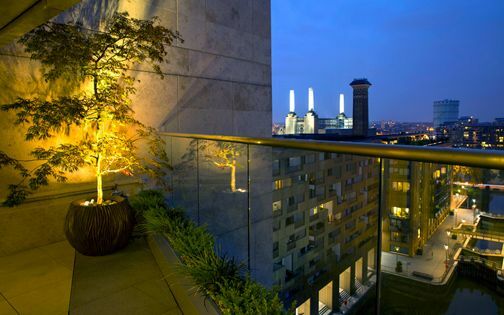 As lower foliage is predominantly evergreen, the deciduous Hazels, Corylus avellana ‘Contorta’, reveal their exceptional outlines throughout winter and early spring. 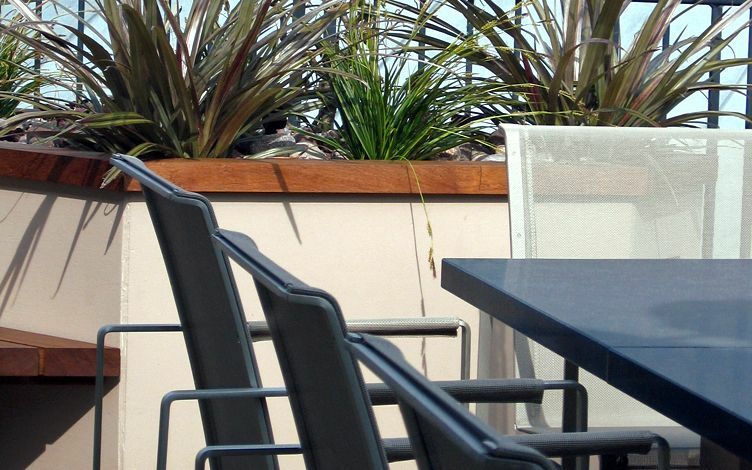 A contemporary bluestone dining table fits snugly within the gridded paving surface, its uprights align perfectly onto the lilac pavers. 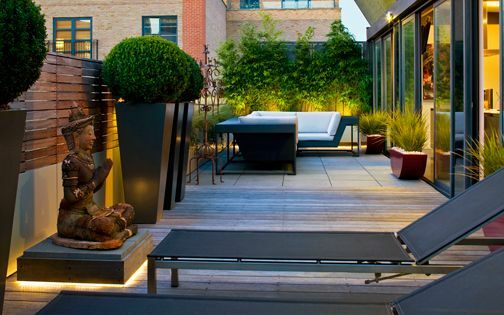 These minimalist design details, crafted by associating streamlined shapes with vertical accents, form a trademark we continually include when developing city penthouse garden designs. 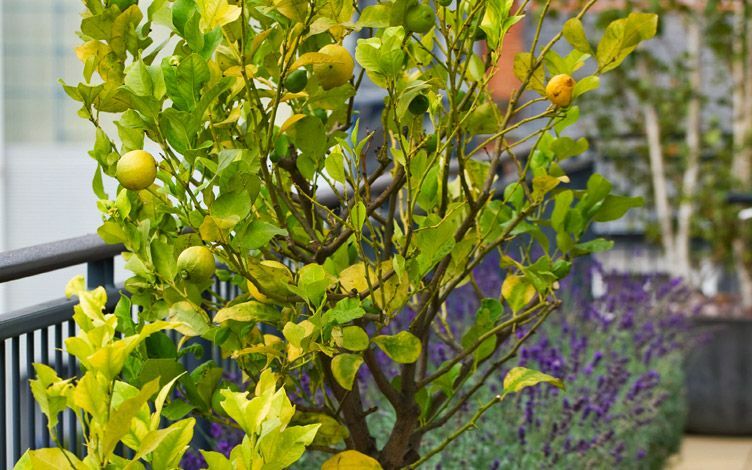 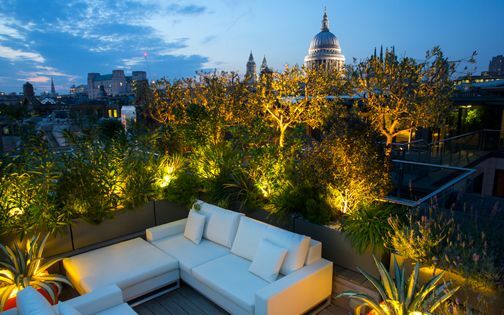 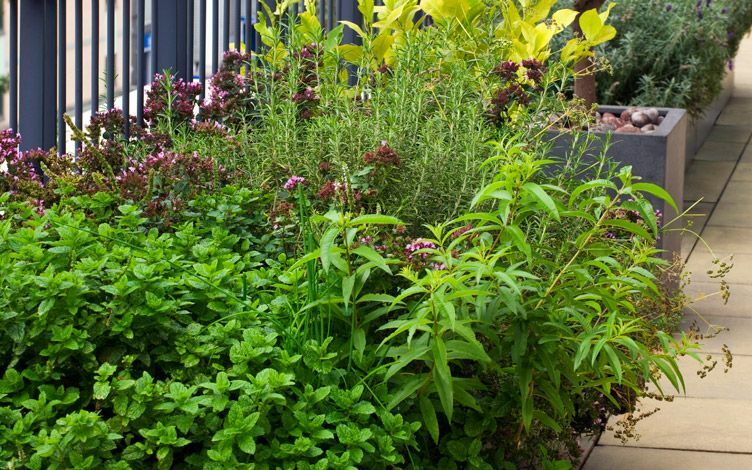 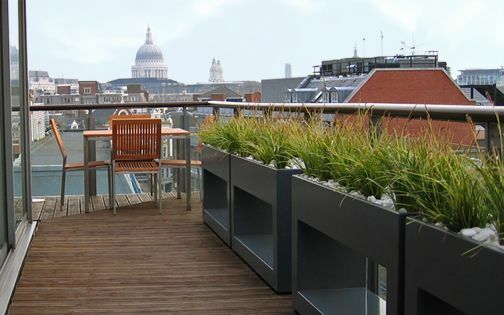 The south-facing rooftop is nestled right above Stamford Bridge football stadium, where a series of planters features a myriad of herbs and a Lemon tree. 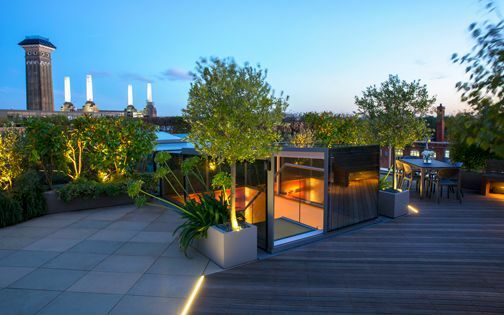 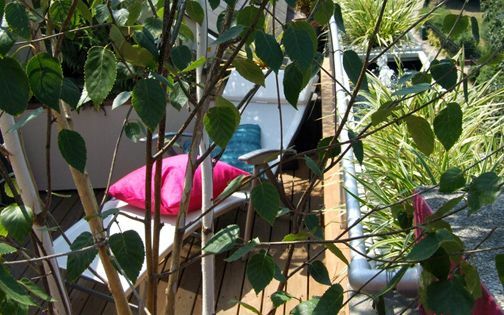 Situated by the kitchen, this roof terrace produces fresh seasonal verdure, hand-picked for home cooking, while a Silver birch tree is repeated from the main roof terrace as a focal point, in a layout which provides a sanctuary for wildlife, with its scented spurts of floral nectar.